The attributes that define a true gentleman have not changed despite the cultural paradigm shift. Although the archaic traditional male/female roles have faded, certain traits remain steadfast in what makes a man a gentleman. A great sense of style and good graces are obvious qualities ALG prioritizes, but, beyond being dapper and polite, other core values should be impressed upon young men and then continue into their mature years. Civility, interpersonal kindness, gratitude and discipline are behaviors that never go out of style and make the modern gentleman. And our world is in dire need of more gentleman. This Father’s Day, ALG Style had the opportunity to get to know two fashionable gentlemen. Being a gentleman is a matter of choice; these two men choose to have both style and substance in all endeavors. Bradley Schneller and Regis Prograis are not only leading by example and molding their young sons, but they are leaders in their industry and have succeeded because of what they have learned from their failures. Initially drawn to them by their fantastic sense of style, it was their infectious personalities, wit and incredible work ethic that made them the ideal candidates for ALG’s archetypes of the modern gentleman. A true gentleman understands the effects of his appearance. The way a man decides to groom, dress and carry himself can be an obstacle or an open-door to success. As for anyone, male or female, when you walk into a room how you want to be treated is based primarily on your demeanor and ensemble. Therefore, when you get dressed each day, take a moment to think what message you are sending to others. Although most days you can find Schneller in fitness attire, he enjoys following or setting the latest trends in men’s fashion. He is also boastful about the fact that he has seen every single episode of Project Runway. “It is important to be who you are and embrace your personality; my choice in attire is a subtle way to showcase my character and love of fashion,” he says. “Nonetheless, you need to be respectful of the situation and others around you.” Although Schneller is not shy about taking fashion risks, he considers the event and the people he is meeting when calculating his ensemble. “Relationships start with a first impression, appropriate attire and good grooming; these conscious efforts help you start out on the right foot,” he adds. Looking sharp and polished can leave positive and lasting subliminal impact. A well-mannered man can effortlessly navigate a social situation with confidence and work a room with proficiency. As a professional boxer and constantly in the public eye, Prograis understands how important it is to think on his toes both in and out of the ring. “You only get one first impression, so make it count,” he says. Prograis hopes to be an inspiration to people of every color, class and creed. Nonetheless, he believes being an inspiring gentleman also requires humility and appreciation. “A gentleman is someone who gives respect to everyone no matter what they have — treat them as equals,” he adds. Graciousness is the hallmark of a great leader. Regis “Rougarou” Prograis is a professional boxer and WBC Super Light Weight World Champion (21-0, 18 KOs). 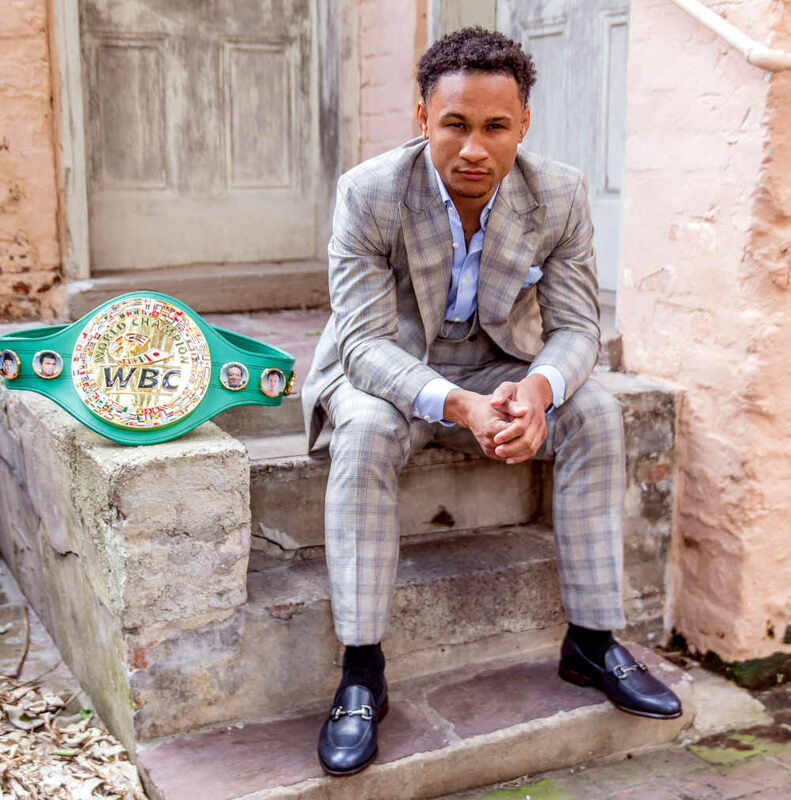 Originally from New Orleans, but training and living in Houston, Prograis wants to dominate the sport of boxing and make New Orleans the boxing destination that it was decades ago. Prograis has two children — a son, Ray (4) and a daughter, Khalessi (1). Prograis’ hard work and dedication to his sport has earned him an undefeated title. Follow him on Instagram @regisprograis. Bradley Schneller is the founder and owner of Roux Fitness and CrossFit Roux (one of the most successful CrossFit affiliates in the country). He is a fitness business consultant for Gymwright, a personal trainer, a husband to Emily Reese Schneller and proud father to Brennan (4) and Vivian (1). Schneller takes great pride and effort in helping others succeed both physically and in turn, mentally. Learn more about Bradley Schneller and Roux Fitness @crossfitroux. Very special thanks to Joe Rotolo and Sonny Mitchell at Luca Falcone for keeping Regis Prograis, Bradley Schneller and the gentlemen of the world in check and in style.